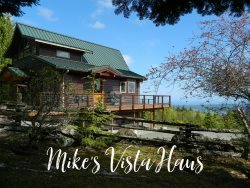 This adorable cottage is in the heart of Port Angeles and close to parks, stores, and local restaurants with the entrance to Olympic National Park at Hurricane Ridge just a few minutes away. Comfortably laid out with 2 bedrooms and 1 bath, it's a perfect getaway for 2 couples traveling together. The front living area has a cozy seating area with Cable TV/DVD player, electric fireplace and dining table for 4. Enjoy lively discussion over a meal and retire in front of the TV with your favorite movie. An outdoor deck features a lovely space to enjoy the yard, a glass of wine and a meal. The whimsical kitchen has a propane stove/oven, dishwasher and microwave. Nicely appointed, you will find it easy to prepare meals or whip up a quick snack. A full bath is off one side of the kitchen and a mud room with full washer and dryer is off the other. Enjoy one of two nicely decorated bedrooms with comfortable queen beds and built in wardrobes. Pet Friendly, the fully fenced yard is great for your furry friend. Located near downtown, enjoy exploring Port Angeles's vibrant waterfront. The Olympic Discovery Trail runs along the water and is great for a leisurely stroll or bike ride. Several local restaurants and pubs have fantastic seafood and Northwest dishes. And don't forget a trip on the ferry to Victoria, B.C to explore the Victorian seaport and gardens. At the end of your day's adventures, you will love coming "home" to the relaxing and peaceful Victorian Cottage. This is a Pet Friendly property. Please inquire with weight and breed of dog upon inquiry for consideration. Weight and breed of dog required at time of inquiry for consideration. Pet Policy will be required to be signed at check in.